DUS Architects have transformed two disused hot air balloons into Mind Igloo—a temporary shelter and projection screen in the Netherlands. The idea—commissioned by Mediamatic as part of the fourth New Order festival—was to explore the creation of new urban spaces through collective thinking. As such, visitors to the installation are asked to remove their shoes, hand over their smartphones and relax in the second, padded bubble, where a selection of images taken from their phones are randomly projected on the interior walls of the balloon. The same people who brought us The Bubble Building – the world’s most temporary structure – want to explore the possibility that one day buildings will pop up only when we need them. 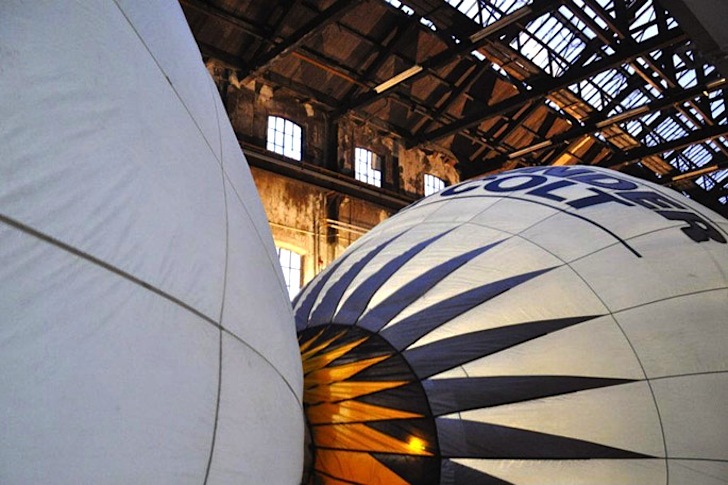 Although the hot air balloons can physically exist on their own, the Mind Igloo is designed to play with the possibility that some buildings might one day rely on the presence and participation of social groups for their very structure. And to a certain extent, the projection aspect of the project doesn’t exist without participants. DUS likens this to a lay-inn (instead of a drive-in), where people relax together and watch their communal, interior lives play out on a shared screen. It’s an abstract concept to be sure, but it’s also an exciting way to re-use hot air balloons that have outlived their former purpose. Be sure to watch the video to see the Mind Igloo come to life. DUS likens this to a lie-in instead of a drive-in! The project is designed to get us thinking about the importance of creating urban spaces through collective thought!